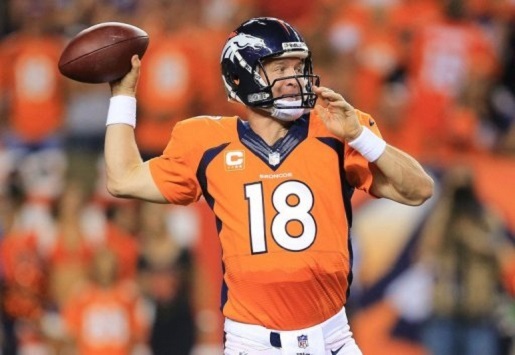 Peyton Manning fires up the laser rocket arm in order to break NFL records. The Baltimore Ravens Super Bowl glory is apparently going to be very short-lived this season. The team has eight new starters on defense, and if they continue to play like they did last night, the team is in for a long season on what has been traditionally been their strongest side of the ball. Peyton Manning tied an NFL record with 7 touchdowns in a single game in a 49-27 route of the Baltimore Ravens. It was a record-setting night for Manning and the Denver Broncos, as they handed the Ravens the largest opening night defeat ever for a defending Super Bowl champion at Sports Authority Field at Mile High in Denver. After being down 3 points at half time, Manning rallied the team with five touchdowns in the second half and really put on an impressive display of passing. Manning finished the game completing 27 of 42 passes for 462 yards and that impressive 7 TDs. Just think, this time last year? Manning looked almost done as he started his Denver Broncos career. Now, he looks like a guy playing even better than last year’s Comeback Player of the Year. Manning ties Joe Kapp, George Blanda, Sid Luckman, and Adrian Burk as the only players to ever throw for seven touchdowns in a game. Kapp did it last in 1969 as a member of the Minnesota Vikings. During last night’s impressive performance, Manning tied the record for most career four TD games, tied the record for most career five touchdown games, set the record for most career six TD games, and of course, tied the record for the most career seven touchdown games. Manning threw for two touchdowns to Wes Welker, two to Demaryius Thomas, two to Julius Thomas, and one to Andre Caldwell.